The Coveside Hanging Wren House is perfect for wrens, who unlike other birds, do not mind the gentle motion of a hanging bird house. The nest box features drainage holes in the bottom corners to keep the nest dry and clean and ventilation holes at the top keep the house from overheating. Constructed from rough-cut eastern white pine, fledglings will be able to climb out when it is time for them to leave the nest. With no perch under the access hole, predators will be denied easy access to your wrens. 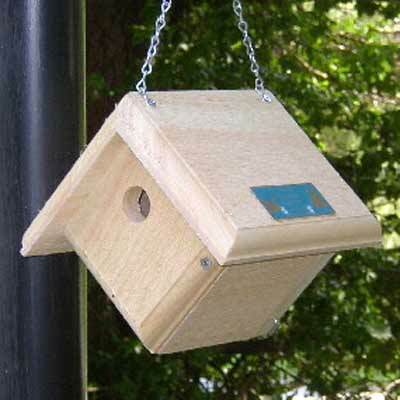 One side of the nest box opens for observation and easy seasonal cleaning. This house may be hung with the included hanging chain. Handcrafted in the USA.